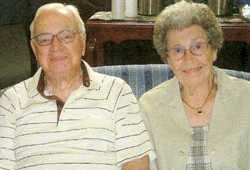 Mildred and the late Donald Frantz met through Mildred's cousin, who went to college with Don. Don was attending Purdue University and Mildred was teaching elementary school, having graduated from Ball State's 2-year teaching college. They went out on a double date with Mildred's cousin and his girlfriend. That was their last date until a year later when Don called Mildred to see if she wanted to go with a group of his friends to a state park for the day. After that day, Don and Mildred began dating, mostly through written correspondence since they lived in different communities. Don joined the Army and was stationed in the Pacific. He and Mildred continued writing. One day, Mildred got a letter from Don telling her that he would be home on leave for 10 days and would she like to get married. They did get married, and then Don left again to serve in the War. When he returned, he and Mildred lived in California for a year. In 1955, the Frantz's moved to Warsaw, where Don became the Extension Officer and Mildred taught at Washington Elementary School. The Frantz's soon adopted two children. Don continued his work at the Extension Office for many years before retiring. Upon leaving the Extension Office, Don worked part-time for WRSW and the Times Union. In 1973, Don Frantz joined the Board of Directors of the then Greater Warsaw Community Foundation. Upon his suggestion, the Foundation was reorganized and expanded to include the entire county and renamed Kosciusko County Foundation. The fund has experienced over 20% growth in value since its inception. The fund has awarded 25 grants totaling 61% of the value of the original gifts. The fund will someday award more in grants than the value of gifts Don and Mildred made to the fund, and the fund will continue to grow! The fund will meet the changing needs of our community, forever! Already, the fund has supported the charitable work of organizations such as Junior Achievement, Symphony of the Lakes, Habitat for Humanity, Council on Aging, Special Olympics, Combined Community Services, Heartline Pregnancy, and several others.